Hans Zimmer’s “King Arthur” score exudes excitement and emotion, breathing life into nearly every scene it touches. There is a ton of exciting Zimmer-style action material, but what makes this score standout from standard Zimmer fare is its heart. Highlights of this crisply produced soundtrack include “Tell Me Now (What You See)” performed by Moya Brennan (sister of Enya). This beautiful melody serves as the love theme in “King Arthur” and is one of Hans Zimmer’s best overall love themes. John Williams had another one of his creative peaks (in a career of endless creative peaks) from 1997 - 2000. He returned to the “Star Wars” universe with “The Phantom Menace” (1999) and had five Oscar nominated scores “Amistad” (1997), “Seven Years in Tibet” (1997), “Saving Private Ryan” (1998), “Angela’s Ashes” (1999) and "The Patriot" (2000). Lost among all of those critically praised scores was his skillfully composed soundtrack for Chris Columbus’s tear- jerker “Stepmom”. One of the wonderful aspects of a John Williams soundtrack is that the music is designed not only to enhance the film it is attached to, but to exist as an emotionally fulfilling stand alone listening experience as well. Whenever he decides to bring in a solo musician, Williams always chooses the ideal artist with the perfect instrument for the score, in this case guitarist Christopher Parkening. Even in a small scale, intimate score such as this, the composer carefully builds his musical tapestry until fully indulging the listener in a deeply affecting emotional crescendo. This underrated John Williams “lite” score is a beautifully composed subtle symphony of color and deep emotion. You would have to be made of granite not to be moved by it. Given its Giallo style sexuality and excesses, Pino Donaggio was the perfect choice to score “Body Double”. The movie came along at a time when both De Palma and Donaggio were at the peak of their creative powers and had a string of successful collaborations together including the popular scores for “Dressed to Kill” (1980) and “Blow Out” (1981). The love theme from “Blow Out” was licensed by Quentin Tarantino and used in “Death Proof”. The soundtrack for “Body Double” is a blast. It is melodically rich and varied and like the film itself, a wickedly excessive piece of iconic pop culture. A must own soundtrack for De Palma fans, lovers of '80s cinema and anyone who likes exciting suspense music drenched in pop eroticism. After “Aliens” (1986) became an action horror classic and “Titanic” (1997) became one of the best selling albums of all time, the prospect of a third collaboration between James Cameron and Horner brought with it an enormous set of expectations. “Avatar” may not have sold a boatload of albums like “Titanic” or became a music for trailers staple like “Aliens”, but from musical and artistic perspective it is a smashing success. The soundtrack for Avatar is a grand epic of orchestral wonder and choral delight that meets those expectations with music that is a far more ambitious and varied than either of Horner’s other two Cameron scores. Track 13, “War”, brings the Na’ve of the film and the listener surging back to live with adrenaline and action music. “War” is 11:22 of exciting, epic music that ranks as one of the best cues of Horner’s prolific musical career. The end credits pop ballad, “I See You” performed by Leona Lewis,is a criminally underrated song that deserved to be successful. The only full length theatrical film directed by Steven Spielberg not to be scored by John Williams. Remember, “Duel” (1971), scored by Billy Goldenberg, was a network made for TV film that was released theatrically overseas only. Spielberg’s Jerry Goldsmith scored “Kick the Can” segment to “Twilight Zone: The Movie” (1983) was essentially a short. 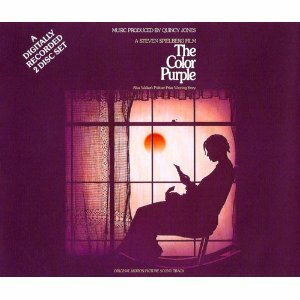 The Oscar nominated score to "The Color Purple" is majestic, epic and yet has a deep emotional intimacy about it. The instrumentation choice is spot on. Quincy Jones and his team of composers created a musical tapestry that shrewdly brings out every ounce of sentiment in Spielberg’s first “serious” film. There is a grand sweep to the soundtrack very much in the mode of what John Williams might have done. But the score is also unmistakably Quincy Jones and has the same touch he and Gerald Fried brought to the landmark television mini-series “Roots” in 1977. The “Reunion and Finale”music that plays during the film’s moving final scene is unforgettable. You would have had to have had an emotional bypass at birth not to be touched by it. “The Mask of Zorro” is an immensely entertaining old school adventure and features one of James Horner's most exciting and original scores. It is brimming with color, melody, and fluid action music. Everything about the music from instrumentation choices to the sweeping love theme works beautifully. This is a top five Horner soundtrack and a must own for film music fans. What makes this score standout is the clean focus and the energy level. The music has the bold themes and strong melodic lines of Horner’s early pre-1990 work. 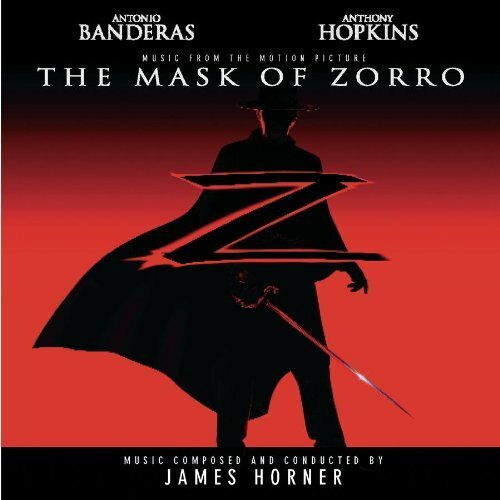 The action music is the most exciting and agile of Horner’s career and the love theme “I Want to Spend My Lifetime Loving You ” is one of his absolute best.It gets a moving treatment in the dramatic cue “Elena and Esperanza”. James Horner’s best post ‘80s genre soundtrack and one of the best adventure scores of all time. Spielberg has a long and storied history of casting naturally gifted child actors and getting seamless performances out of them. One of the cool touches in “The Temple of Doom” is the Short Round character played by Jonathan Ke Quan. “Short Round’s Theme” is one of the best themes in any Williams' score and this terrific, fluid piece of symphonic wonder gets a full fledged strong statement in both track 7 “Short Round’s Theme” and track 22 “End Credits”. Two of the most sought after pieces of music missing from the old Polydor album and Japanese CD are “To Pankot Palace” and “Approaching the Stones”. “To Pankot Palace” is a thunderous villain march and “Approaching the Stones” is the chill inducing quasi-religious mystical music playing as Indy reaches for the magical stones. Both are knockout cues. An entire book can be written about just the Jerry Goldsmith horror and suspense soundtracks alone. There have been countless classics by the master over the last fifty years including Magic (1978) and the Oscar winning The Omen (1976) and its two sequels. But Poltergeist” stands out as one of the most complete, varied, complex, muscular and entertaining works composed by Goldsmith at the peak of his great orchestral might. The most famous piece of music is the beautiful lullaby-like Carol Anne’s Theme”. It is the heart of the score and heard over the opening and closing credits. The rest of the score contains some of the most aggressive horror music ever composed. The Clown takes a creepy hold, drawing the listener in as Goldsmith expertly builds into riveting suspense with cues like "Twisted Abduction" and "Contacting the Other Side" before unleashing an orgasmic orchestral explosion of quasi-spiritual beauty in the haunting "The Light". Steven Spielberg’s criminally underrated dystopian science fiction fairy tale is the most complex, polarizing, haunting, deeply affecting, and achingly beautiful film of his storied career. The same exact wording can be used to describe John William’s minimalistic musical masterpiece, a score so charged with deep emotion, it will stay with you forever. The vast array and focused intensity of the emotional intimacy of the soundtrack is impossible to verbalize. One simply has to listen to it. No, not listen to it, experience it. Even the hauntingly beautiful song “For Always” performed by Lara Fabian and Josh Groban is a profound achievement in soundtrack music. This soundtrack has been mentioned several times in this column over the past two years, but never given a proper review. That is because it would be utterly impossible to do justice to this avante-guarde masterwork in less than 800 words. Intricately layered and carefully structured with a precision for detail that borders on maddening genius. Every note has a distinct purpose and every motif, theme, melody and movement aggressively moves this propulsive score forward with an addictive combination musical athleticism and sheer brute force that it defies belief. Full or wonder, brimming with non-stop excitement and always a fresh listen even after thousands of spins, “Total Recall” is the greatest action score of all time. A few runners up that just missed the cut.